I suppose that if we were normal human beings we would be telling you that our favorite activities to do as a couple include long walks on the beach, or whittling pieces of driftwood into home decor pieces, or reading poetry to each other in front of the fireplace. But no, our very favorite thing to do as a couple is annoy each other. We are really good at it! Professionals, really. We can sit in the same room for hours and just make random noises and sounds and comments to each other that we know will irk the other one. I have a truly amazing ability to sing incredibly off-key quite loudly. And I use that ability. Oh I use it. I also have been blessed with the gift of pretending to sing opera. I make use of that. Naturally. Seth can make this one sound and hold it for ridiculously long period of time and it never ceases to annoy me. He is also incredibly skilled at asking annoying questions over and over and over again. We aren't being mean to each other - we are just child-like (or childish, depending on your perspective). So what could be better than to annoy him with than banana bread with Nutella swirled in it? I totally foresee questions like - how in the world is banana bread an annoyance? Well, Seth HATES bananas. Passionately. He can detect when a baked good has banana in it from like a mile away. It is uncanny. Now I just have to sit back and wait to see how he retaliates. Heat oven to 350. Grease a 9x5 loaf pan. Whisk flours, baking powder, baking soda, and salt in a medium bowl. In a large bowl, stir together brown sugar, bananas, canola oil, milk, eggs, vanilla extract, and almond extract. Gently stir the the flour mixture into the wet ingredients, being careful not to over mix. Stir in the flax seeds, and toasted walnuts. Pour batter in loaf pan. Swirl in the Nutella. Bake for about 45-50 minutes, until the loaf has a golden-brown color and a cake tester comes out clean. Hahaha, if making banana bread annoys him, then I think you should annoy him. Constantly. If it makes you feel any better, I know more couples that annoy each other than whittle driftwood. Haha this post is kind of hilarious and adorable. And the banana nutella bread looks beyond delicious, if only I had some ripe bananas ready to mash! #2-Michael hates bananas too. Him and Seth are dumb. We love em, but they're dumb, right? Marvelous bread here. Love the marbled swirls of nutella - very attractive! The top of that bread, with all it's swirls looks soooo good!! 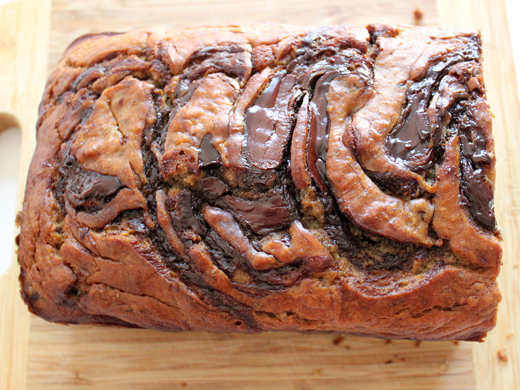 SO moist and yummy with the swirls of Nutella! Perfect way to start the day! Jenn, I am with Seth I hate bananas and never eat them just by themselves but I really don't mind them in something like this banana bread, it really does look delicious. Good luck on the pay back, LOL. This look amazing. Nutella is a magic word in my house. Also: Bananas are amazing. 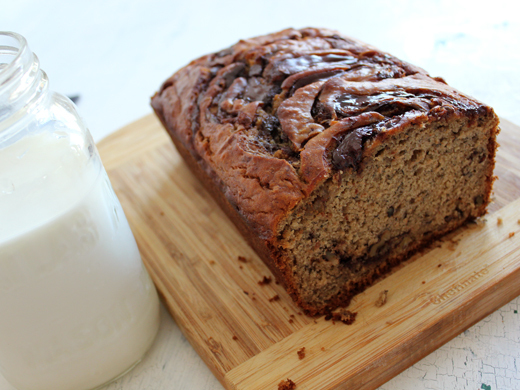 This banana bread sounds incredible and perfect for fall! Looks great! Love that Nutella swirl. My husband would love that! Pinned so I can make it for him as a surprise :) (And if it annoys Seth I guess that's a double bonus for you since you can talk about how everyone else loves it). I can't imagine anyone not liking bananas (especially in banana bread form)... Seth is missing out big time/good for you for making this to spite him! Love the idea of banana and Nutella co-mingling together in one baked good. Genius! Dear lord, what did you do? OMG! I made banana nutella bread a while ago based on someone's recipe and we loved it! Your top has more nutella on it and looks delicious and appealing for my kids!! Even swirling all that nutella into it can't lure him over to the dark side? I understand because there's a banana hater in my family too. More for us! My daughter adores banana. Combine it with nutella and she is in pure heaven. LOVE everything about this beauty! I'm dying to make this. I have some bananas just begging to mix it up with nutella. Who can blame them?